Thanks to a generous donor, your commitment to our Advocacy Fund will be matched, dollar for dollar. Multiply your contribution while supporting CPF’s statewide advocacy efforts. Click the button below to donate. The California Preservation Foundation provides a wide range of support, from hands-on training to statewide advocacy. We offer diverse educational opportunities, ranging from webinars and workshops to a 4 day-conference filled with over 30 educational sessions, workshops, and study tours. For more information on webinars and workshops currently scheduled or how to request one in or near your community, go to the Education section of our website. CPF receives advocacy requests continually, so check out this page for an up-to-date list of Advocacy Alerts. Request assistance, and read more about how we decide when and where to act. We are deeply committed to educating and training the next generation of preservationists. We provide free membership to students, as well as scholarships and the opportunity to be matched with a professional mentor. View or add preservation job listings in California and beyond. The California Preservation Foundation Resource Directory is a list of professionals involved in the preservation or development of historic properties. Explore our FAQ to find answers to your preservation questions, from CEQA to Surveys and more!. Property owners interested in donating preservation easements may request easement application packet at the link above. 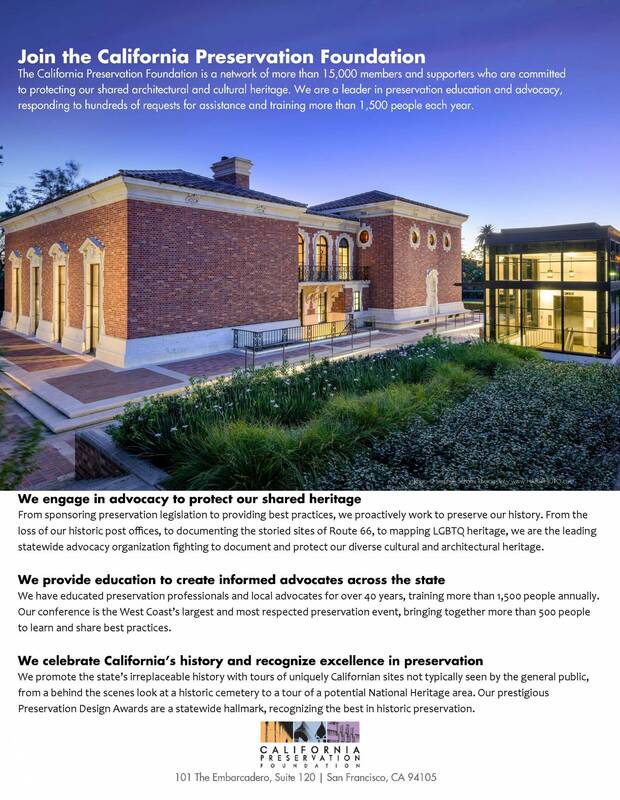 Click here for a list of preservation resources from across California and around the country. CPF has diverse educational opportunities for a variety of prices ranging from webinars and workshops to a 4 day-conference filled with over 30 educational sessions, workshops, and study tours. For more information on webinars and workshops currently scheduled or how to request one in or near your community, go to the Education section of our website. Information on our upcoming and past conferences can be found in the Conference section. CPF also offers on-site technical assistance and direct support through the Field Services program, in partnership with the National Trust for Historic Preservation. The Field Services Director can help to assess local preservation needs; coordinate alliances and develop partnerships; provide guidance on solution based strategies; convene meetings, workshops, presentations, etc. to assist with advocacy and education efforts in local communities; and provide linkages to consultants, informational resources, and potential financial sources. There are a variety of resources available at your fingertips. Please explore the website for a lot of valuable information. If you have a specific preservation issue or question, please contact the Field Services Director.